This instrument is larger than the other similar English folding rule in the collection in Florence (Epact 70248), but was intended for use in the same operations as the smaller instrument. The flattened legs, bearing numerous markings and degree scales, are provided with sights. 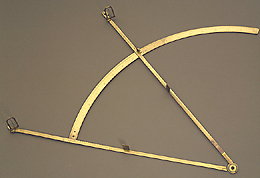 The graduated arc allowed the extension of the legs to be observed and permitted angular measurements to be carried out. The instrument, which lacks some parts, originated in Robert Dudley's bequest to the Grand Duke of Tuscany (1649).